From supermarket aisles to criminal trials Jump to media player Luke Penney goes from working on the supermarket checkout to deliberating over criminal cases. 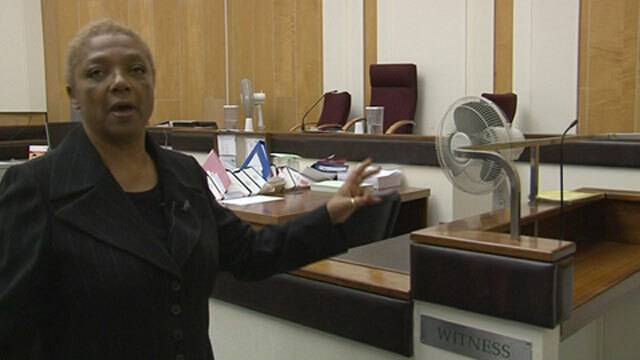 How a Magistrates' court works Jump to media player Valerie Murray-Chandra offers a tour of the Magistrates' Court in Highbury Corner, north London, where she sits to hear criminal cases. When he is not working on the supermarket checkout, 22-year-old Luke Penney can be found in a court room. The young magistrate from Neath can go from helping shoppers pack their groceries to deliberating over criminal cases. He applied for the role after a woman asked to put up a flyer in the store, recruiting magistrates. One year into the job, he said he is a "completely different person" in court to when he is behind the tills.